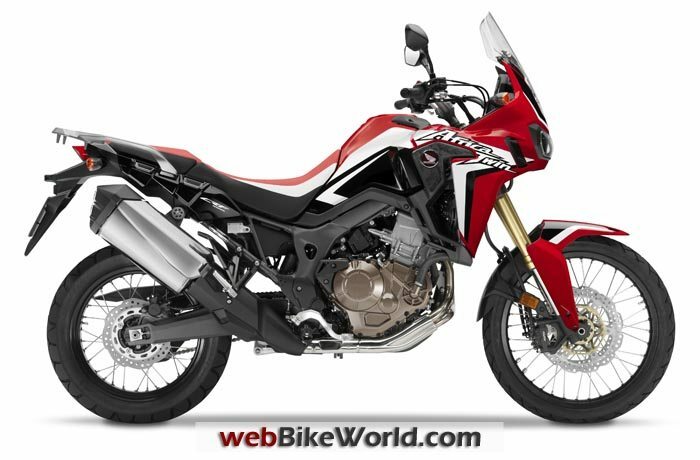 CRF1000L Africa Twin Confirmed for 2016 Model Year. 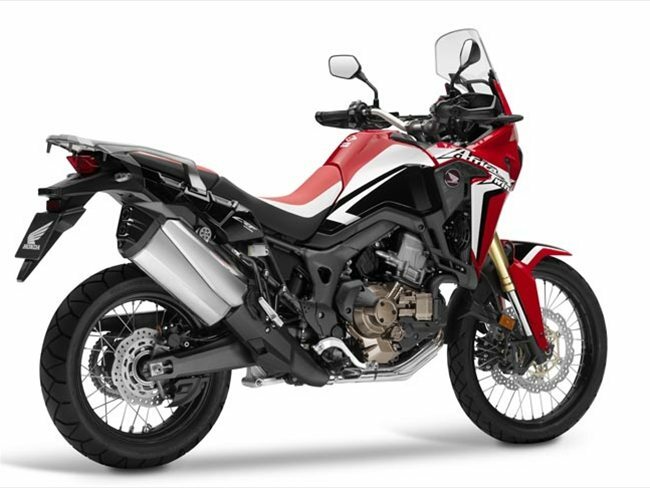 Honda has announced the return of one of motorcycling’s most celebrated and evocative names: the Africa Twin. 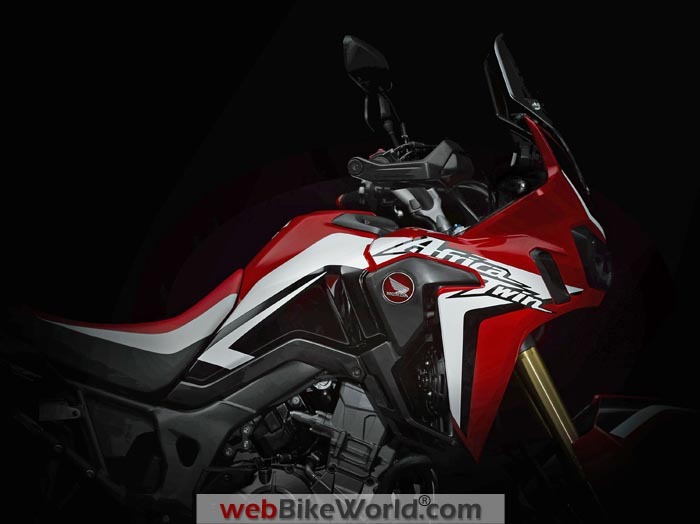 Having shown the direction of its development and intent with the reveal of the True Adventure prototype at EICMA in November 2014, American Honda can now confirm that the all-new CRF1000L Africa Twin will be in U.S. dealers early next year. 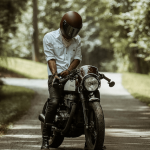 Some motorcycles encapsulate perfectly what an adventure motorcycle is all about. The original XRV650 Africa Twin — which debuted in 1989 after Honda’s four successive wins in the Dakar Rally — was one such machine. Its go-anywhere ability, rugged durability, agile handling and all-day comfort made it the perfect partner with which to explore. And it helped to define a motorcycling segment that has now grown into one of the most popular worldwide. 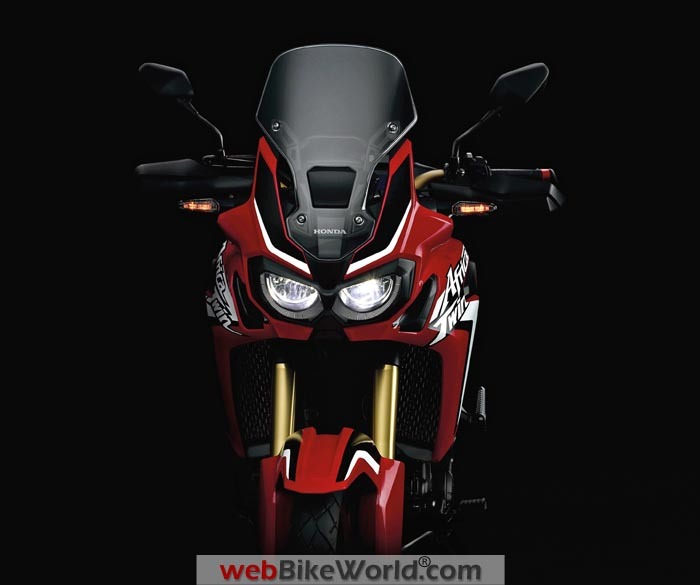 (September 1, 2015) – Powered by a brand-new 998cc parallel-twin engine, the Africa Twin is available in two versions, one with a highly advanced Dual Clutch Transmission (DCT), and another with a standard gearbox. Pricing is set at $13,699 for the DCT version and $12,999 for the standard gearbox. 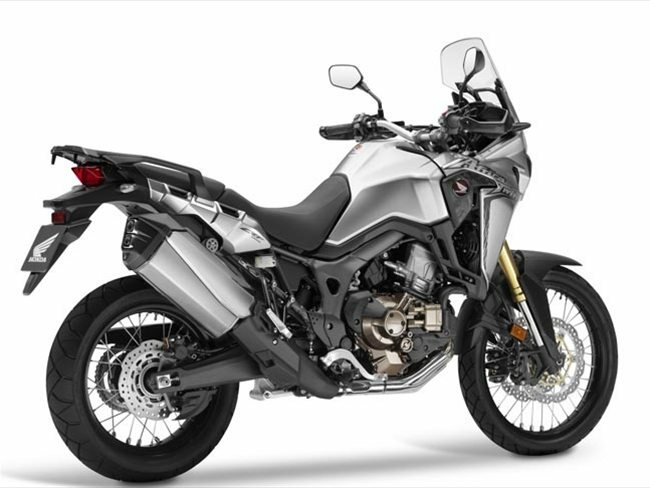 Both versions come standard with ABS and Honda Selectable Torque Control (HSTC) and Honda claims both are extremely capable in highway and off-road applications. But the DCT version weighs a substantial 31 lbs. more than the standard gearbox version. The new Africa Twin remains true to all the attributes and abilities of the XRV650 and its successor, the XRV750, while adding the benefits of everything Honda has learned on and off-road over the last decade, including Team HRC’s return to the Dakar in 2013. 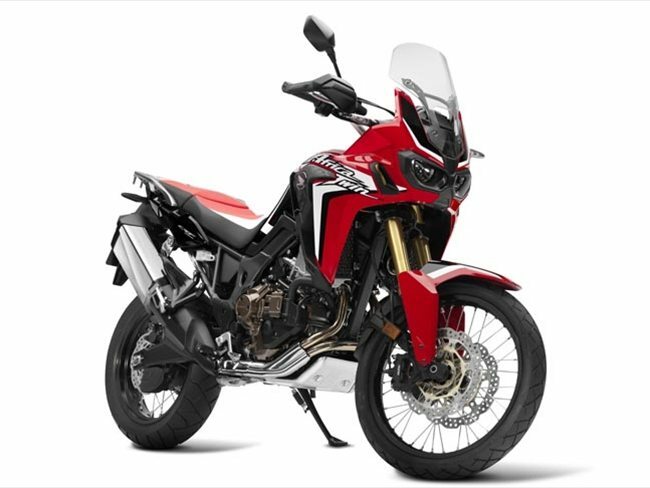 Furthermore, in a first for the category, the Africa Twin will feature the option of a new evolution of Honda’s Automatic Dual Clutch Transmission (DCT) technology, which remains unique to Honda in motorcycling. 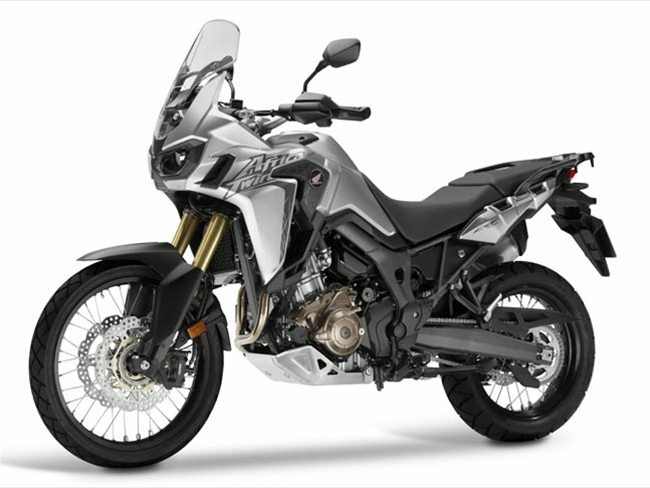 This latest evolution of DCT has been specifically developed and programmed to provide the off-road ability with which the Africa Twin is synonymous. 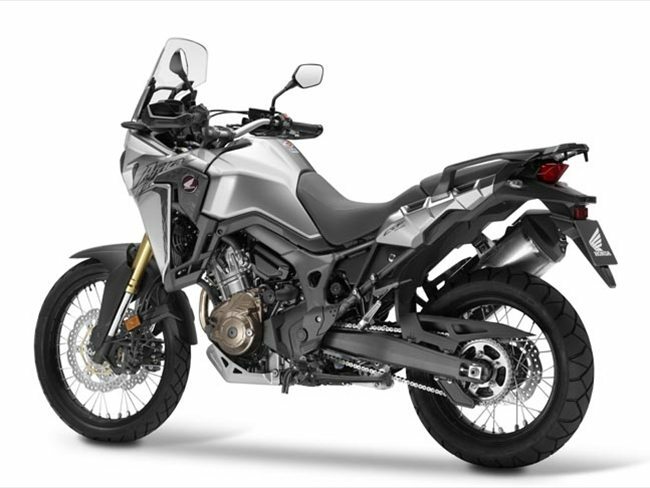 UPDATE (July 2015): (Press release edited by webBikeWorld) Honda has now released details and specifications (table below) for the Africa Twin, which will be in Honda showrooms across the United States in early 2016. 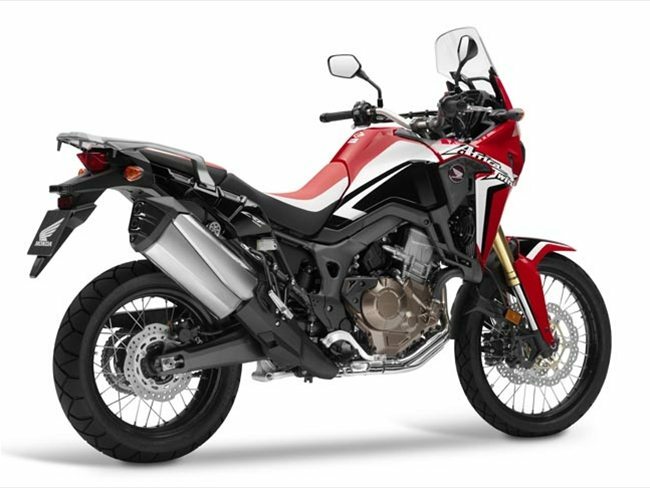 Like its celebrated forerunners, the CRF1000L Africa Twin is thoroughly equipped for true adventure, with a potent engine and dynamic chassis ready to explore continents, on- or off-road. From the start of the CRF1000L Africa Twin project, there was one motorcycle that consistently impressed with its balance of usability, poise and handling, on the road and in the dirt: the seminal XRV750 Africa Twin. It proved a worthwhile benchmark, even when set against today’s myriad choice of adventure motorcycles. The machine that now bears its name shares no common parts with the old model but it inherits the full the essence and spirit of what made the XRV750 Africa Twin so good. The “true adventure” approach starts with the engine, which has to perform in off-road situations as well as on-road long-range touring and all points in between. The CRF1000L Africa Twin’s 998cc parallel-twin power plant draws heavily on Honda’s off-road race experience with the CRF250R/450R competition machines, and uses the same four-valve Unicam head design for compact overall dimensions. A lightweight cast camshaft, using the same materials as that on the CBR1000RR, operates the valve train, and twin spark plugs fire the fuel/air mixture in each combustion chamber. Strong and linear power and torque deliver instant response anywhere in the rev-range, accompanied by a satisfying, characterful deep growl as rpm rises. A 270° phased crankshaft gives the power delivery a distinct character as well, delivering excellent feel for rear-wheel traction. Biaxial primary balance shafts cancel vibration. The engine’s short height contributes to the CRF1000L Africa Twin’s excellent ground clearance; another prerequisite for a true adventure machine. It also uses clever packaging of componentry to both dynamic and aesthetic effect. The water pump is housed within the clutch casing, and the water and oil pumps are driven by a shared balancer shaft. Further reducing engine size is the lower crankcase design, which stores the oil and houses the pressure-fed pump. 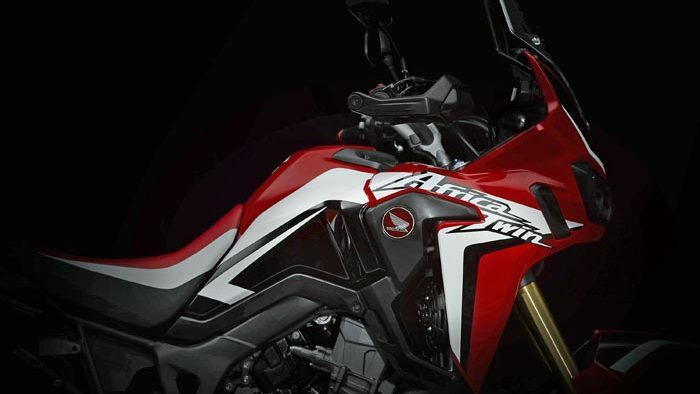 For the CRF1000L Africa Twin’s chassis, three key attributes — highlights of the original XRV750 — were targeted: off-road performance, touring comfort and the everyday agility that makes for a great all-rounder or day-to-day commuter. A steel semi-double cradle frame provides a balance of highway touring capability, even while fully loaded, genuine off-road performance, agility and sheer strength. Mass centralization, with items like the battery packaged at the rear of the cylinder head, contributes to a low center of gravity. The long-travel Showa inverted fork is fully adjustable and features dual radial-mount Nissin four-piston brake calipers and 310 mm “wave” style floating discs. The Showa rear shock has hydraulic spring-preload adjustment. Like the CRF450R Rally, the CRF1000L Africa Twin uses 21- and 18-inch front and rear spoke wheels, wearing 90/90-21 and 150/70-18 tires. 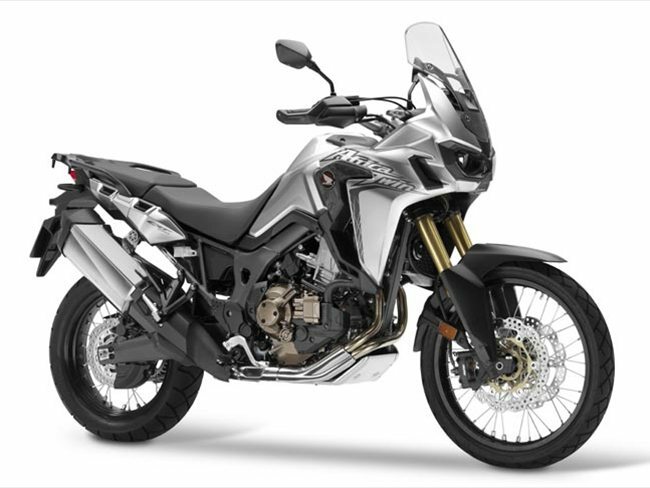 Following its design theme of “unlimited adventure,” the Africa Twin is styled with minimum bodywork in a tough, lightweight form that offers both weather protection for the rider and a slim, agile feel. Dual headlights maintain the original’s signature presence and the seat height adjusts .8 inches to either 34.3 or 33.5 inches. A large 4.96 gallon fuel tank, coupled with the engine’s fuel efficiency, stretches the distances between refueling stops. 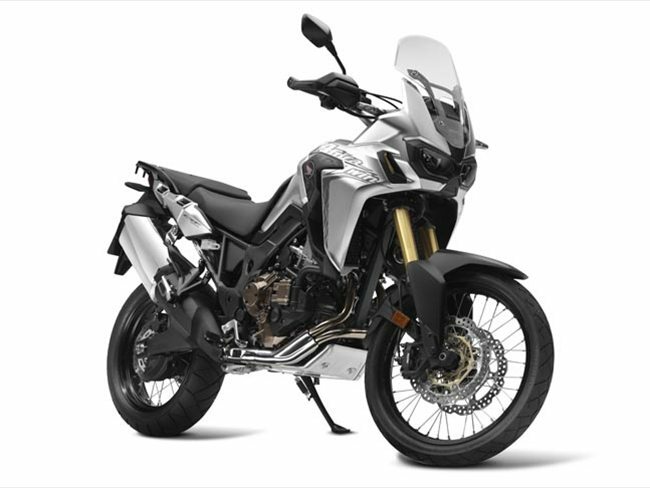 To tailor the overall electronics package to capably tackle any conditions on- or off-road, the Honda Selectable Torque Control (HSTC) system offers three levels of control, and it is possible for the rider to turn off the ABS system for the rear wheel. (HSTC and ABS not available on base version; equipped as standard on DCT/ABS version). 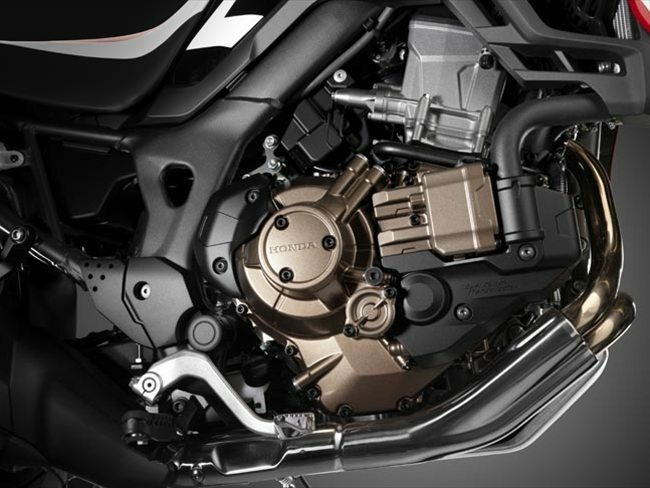 Dual Clutch Transmission (DCT) Honda’s unique Dual Clutch Transmission (DCT) will be available as an option on the CRF1000L Africa Twin, with the use of a common crankcase keeping the width the same as the manual transmission version. It features the standard manual mode, allowing the rider to operate gear shifts through triggers on the left handlebar, and two automatic modes. D mode offers the best balance of fuel efficiency and comfort cruising. S mode gives extra levels of sport performance, with three different shift patterns to choose from: S1, S2 and S3. In certain situations on the road, such as during low-speed maneuvers, the DCT partially disengages the clutch to reduce the effect that quick throttle movements have on the chassis. 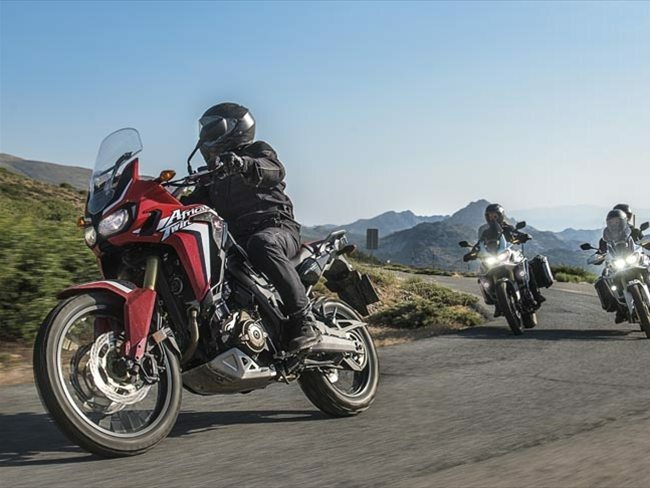 Of course, DCT for the CRF1000L Africa Twin is also fully equipped to operate in an adventure environment. 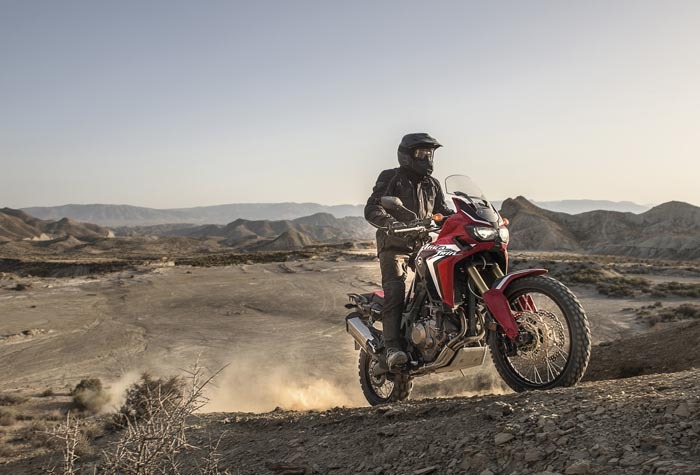 With the G switch on in any riding mode, the connection between the throttle and the rear wheel is more direct, which can be desirable in certain off-road situations. The NXR750V, a full HRC race machine, faced stiff competition in the grueling Dakar Rally through the late 1980s but won in 1986 and 1987 in the hands of Cyril Neveu, in ’88 with Edi Orioli and finally in ’89 piloted by Gilles Lalay. he road-going XRV650 Africa Twin was produced in 1988 and ’89 by HRC in tribute to their efforts, and it laid the foundation of what would become a legendary machine. In late 1989 the XRV750 Africa Twin was launched and quickly became an adventure touring benchmark. It featured a 742cc, 6-valve liquid-cooled V-twin engine (producing 60 hp and 46.2 lb.-ft. torque), long-travel suspension, a large fuel tank, chain final drive, a 21-inch front wheel (widening off-road tire choice) and dual front disc brakes. Revised twice and in production until 2003, it remains a sought-after machine today, with good examples commanding premium prices. After a 24-year absence, Honda returned to the Dakar Rally in 2013 with Team HRC. For that edition of the race (now run in South America) they developed the CRF450 RALLY — a motorcycle based around the enduro-spec single-cylinder CRF450X — and entered three riders; Team HRC reached their primary target of all machines reaching the finish line. In 2014, with a completely new CRF450 RALLY, Team HRC brought a five-man squad to the event; Spaniard Joan Barreda went on to take five stage wins. The 2015 event saw Team HRC come even closer to their ultimate goal, with Portugal’s Paolo Goncalves finishing runner-up in Buenos Aires. Team HRC scored the greatest number of stage victories and Joan Barreda proved an unyielding leader throughout the first week of the rally, collecting more stage wins than any other rider in the 2015 edition. Laia Sanz, in ninth, surpassed all of her own objectives and made history by finishing higher than any other female in the history of the Dakar Rally.